This game was so fun!! I loved the magnifying glass clues and little pipe musings. I love the mechanic of walking into thoughts on the path, and the mechanic for the bus trip home. And I loved that it wasn't just a typical bitsy of little blob characters - there was actual art of the character as well. The music is wistful and charming. Thank you for telling this story. This was cute! It reminded me of Pokemon Stadium's sushi mini game if it had been rendered instead for the Gameboy Color! I'm not really sure what determines "accuracy" though, or how to improve my accuracy. This game was super fun and true to genre. I loved the feeling of being alone in a little valley surrounded by mountains. Can you win the game?? It's hard enough that I didn't even make it to winter. I really love the style of this game! I grew up with Oregon Trail so this version of it is very welcome. Would love more features to make it a true alternate version - a destination you're trying to make it to, opportunities to barter, etc. I liked this game, but the ending after defeating the final boss at each level felt a little anticlimactic because there was "dead space" at the end where I was flying and not doing anything. thank you for this gift of possum. i would next like to dress up a raccoon from montreal. or perhaps another trash animal from another canadian city. and they can all be in a punk band together. I love this little machine! I love even more reading everyone's comments and how hopeful they are that their gifts are received by someone who will appreciate them. 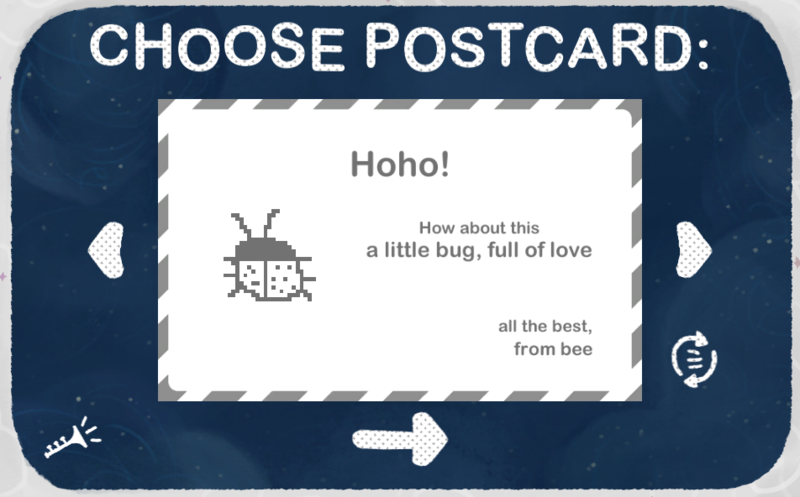 I sent out this little bug...and received one (1) Sans Undertale. God Bless. I love this little story. I think I identify with G more than the protagonist, only because my sweetheart is the one who takes work trips, not me. Sometimes it feels like I'm sending messages into a void, but having this perspective that my loved one is probably also reading my messages and treasuring them is helpful. The soundtrack might be my favorite part. I would love an "update" or something where the protagonist gets to go home and leap into G's arms! Maybe navigating the trip home while receiving texts from G.
It might be a problem on my end, but when I went to watch the moon the night I received the rain email from my sweetheart, I was able to pan at first, but then things seem to have gotten stuck. I wasn't able to pan and I couldn't exit and had to refresh the page and start over. look at my beautiful GF (insert one million crying emojis)!!!! her name is Gilberta and she's my best friend. we have a date at the ramen shop tomorrow and afterwards we're gonna watch Adventure Time and snuggle. I really liked the scenery design and the music! Some Bitsy games I've played are lacking in both. Thank you for making this. This is one of the better bitsy games I've played. I like that it was inspired by a short story. I think this could really help people get in the mindset of characters by playing through the plot like this. It makes me think about connecting youth (like high schoolers) with more classical literature. You should make more bitsy games that take you through short stories as the main protagonist! May I suggest The Lottery by Shirley Jackson?